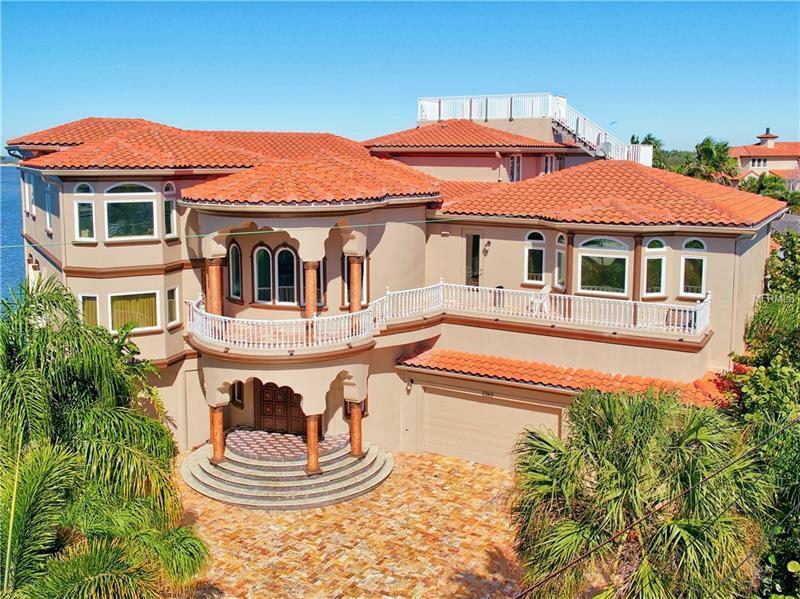 Opulent waterfront estate perfect for the buyer who loves to entertain and appreciates magnificence! Breathtaking entry w/cathedral ceilings and exquisite dual staircase with marble balustrades & blue granite risers on every step. A work of art at every turn w/thousands of sq ft of granite marble & onyx imported from around the world. You will marvel at the more than 3000 sq ft party space w/180 degree waterfront views. On either side of this gallery you’ll see the detailed Africa game room & Hawaiian themed party kitchen perfect for special occasions. Anderson sliding glass doors open to the wrap-around Travertine patio/pool area. This space is aglow at night with gas tiki torches & fire pit which surrounds an artistic dolphin fountain. The main living floor is equally as impressive with its chef’s kitchen w/separate butler’s kitchen. Glowing onyx & gleaming granite draw your eye to the formal living & dining areas which are separated by a 180 gal salt water aquarium. The 2nd floor offers views across St. Joseph’s Sound out to Caladesi & Honeymoon Islands. Also on this level you’ll find the state-of-the-art Egyptian themed home theater with seating for 20 & the Rain Forest Room perfect for fitness meditating or massage. A personal tour is the only way to experience the years of thought and talent that went into this property. Combined with the home’s old world beauty is the tech savvy Control 4 system allowing easy mgmt of the estate’s lighting sound temp control & security.